Climate change barely featured in the UK election. No surprise there: it wasn’t big in previous ones. We’ve become so used to this it largely passes unremarked. But perhaps it’s not inevitable. Climate change doesn’t come to mind when most people think about the issues facing them or the country. Apart from briefly after the 2013/14 winter floods, it’s barely registered in the various tracking polls. But when prompted, people overwhelmingly say they’re worried about it. 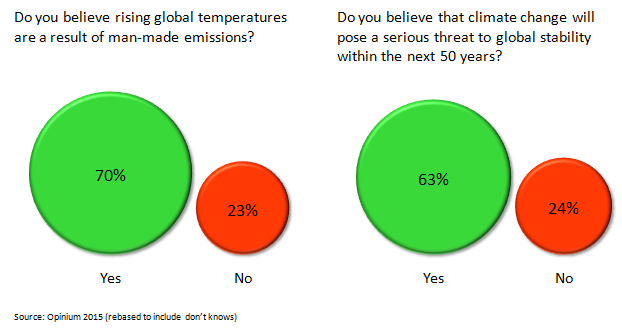 So, if nearly 2 in 3 people think climate change will be a serious threat to global stability, why don’t any major parties try to use it to their electoral advantage? Perhaps it’s because climate change is something that people don’t think about much: it’s not visible in day-to-day life, so there’s little clamour for political action. But if that were all, the potential would still exist for it to be more salient since, when they’re reminded of it, so many people are worried about climate change. The problem is, there doesn’t seem much for a politician to gain by banging on about the climate. The major parties’ positions look broadly similar to a non-specialist. They all agree climate change is a big problem and say they’re committed to cutting emissions and supporting adaptation. Unless you’re really into the detail, it’s hard to see why worry about the climate should lead you to vote for one party rather than another. So from a party strategist’s perspective, there’s not much reason to make climate an electoral issue, when the other parties can shut it down by saying they’re equally worried. What parties need are dividing lines – to put themselves on the ‘right’ side of an issue and their opponents on the ‘wrong’ side. The Tories did this in 2015 on relations with the SNP, and in 2005 on immigration. In 1997 Labour used public services. Are there climate change dividing lines?